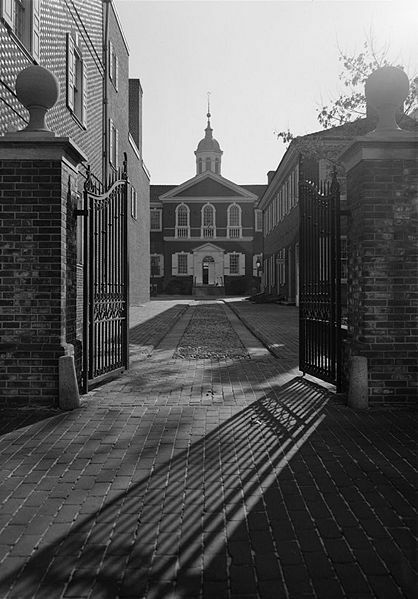 The first Continental Congress met in Carpenter's Hall in Philadelphia, from September 5, to October 26, 1774. Carpenter's Hall was also the seat of the Pennsylvania Congress. All of the colonies except Georgia sent delegates. These were elected by the people, by the colonial legislatures, or by the committees of correspondence of the respective colonies. The colonies presented there were united in a determination to show a combined authority to Great Britain, but their aims were not uniform at all. Pennsylvania and New York sent delegates with firm instructions to seek a resolution with England. The other colonies voices were defensive of colonial rights, but pretty evenly divided between those who sought legislative parity, and the more radical members who were prepared for separation. Virginia's delegation was made up of a most even mix of these and not incidentally, presented the most eminent group of men in America. Colo. George Washington, Richard Henry Lee, Patrick Henry, Edmund Pendleton, Colo. Benjamin Harrison, Richard Bland, and at the head of them Peyton Randolph — who would immediately be elected president of the convention. The Congress had two primary accomplishments. The Association was a compact among the colonies to boycott British goods beginning on 1 December 1774. The West Indies were threatened with a boycott unless the islands agreed to non importation of British goods. Imports from Britain dropped by 97 percent in 1775, compared with the previous year. Committees of observation and inspection were to be formed in each colony for enforcement of the Association. The entire colony's Houses of Assembly approved the proceedings of the congress with the exception of New York. If the “Intolerable Acts” were not repealed, the colonies would also cease exports to Britain after September 10 1775. The boycott was successfully implemented, but its potential for altering British colonial policy was cut off by the outbreak of the American Revolutionary War. The second accomplishment of the Congress was to provide for a Second Continental Congress to meet on 10 May 1775. In addition to the colonies which had sent delegates to the First Continental Congress, letters of invitation were sent to Quebec, Saint John's Island, Nova Scotia, Georgia, East Florida, and West Florida. None of these sent delegates to the opening of the second Congress, though a delegation from Georgia arrived the following July.